SHAREit, one of the most basic apps for transferring files from one device to another, is planning to make it big in India. According to SHAREit’s co-founder Michael Qui – they are planning to recruit 20 – 30 people next year for their new office sited in Gurgaon. SHAREit is for sure the most significant application talked about right now, especially in India. What do you think? The app is working at lightening speed for its users. As compared to Bluetooth (a file transferring software) SHAREit works 200 times faster. Yes, Bluetooth can be used in moving data to different devices but not in the case of cross-platform sharing. Meanwhile, the company also planned to introduce some new versions of Shareit for Windows PC and Macbook. For instance, if I want to share music files with iPhone or iOS devices via Bluetooth: then I am sorry we can’t. Whereas, SHAREit leads you to a new experience where users can connect to the iOS device and share files instantly. Currently, SHAREit plans is working on its new application like WRITEit (enables you to draw or write with a free hand on the screen), CLONEit( allow you to keep a backup of your critical data). They are the “it” products of SHAREit that are soon to be the best in the market. According to Mr. Qui, SHAREit right now would be focusing on content data. It’s noticed that people want to share content like Music, videos, apps, etc. Therefore, they are talking to some content providers but refused to reveal the names. It would be a great leap of faith taken by Lenovo for SHAREit in India. Where India is the future of technology but undoubtedly it is a very unpredictable market to focus. Therefore the developers are even slowly moving towards the USA market, as they see a lot of potential for this fast file sharing application there. 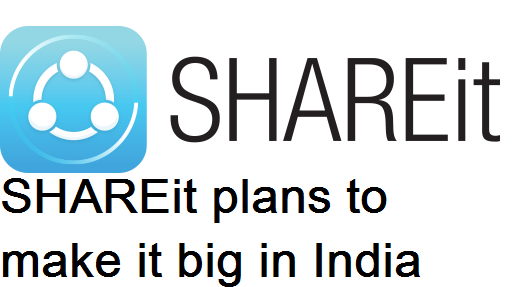 SHAREit is running ahead with expansion India taking this as a station rather than passing by train. We are hoping for the best. What do you think?